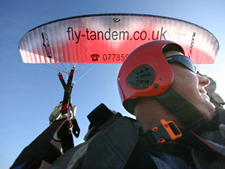 Tandem Paragliding flights are carried out either using our towing system or by hill launching, see details below. Towed Launching involves towing the Paraglider into the air to heights of around 500' before releasing the tow line, then being free to fly around before returning to the launch point. Stunning views of the Cornish coast line are to be had along with the chance of picking up some extra lift to extend the flight. With the large range of wind conditions that tow launching can accommodate flights take place on a more frequent basis than Hill launched ones. 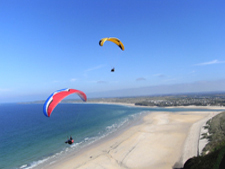 Hill Launching takes place from a suitable site when the wind is blowing onto the hill, the Paraglider takes off into the "lift band" and soars along the hill climbing in altitude giving spectacular views of the coastline. Flights normally last for between fifteen and twenty minutes, conditions and passengers permitting, and consist of soaring above the Cornish cliffs with the seagulls before hopefully landing back on top with a huge smile! Hill flights are more weather dependant than Towed flights and therefore may take place less frequently. All such flights are carried out by fully qualified and experienced pilots on a purpose built glider and all equipment is supplied. 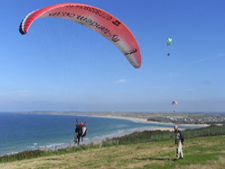 Costs involved are Tow launched £65.00 and Hill launched at £129 both of which include £15.00 for mandatory temporary membership of the British Hang Gliding and Paragliding Association which provides legal liability insurance (third party). An ideal gift and unique experience, one to remember!